Tracy jokes around with the kids. All photos courtesy of Tracy McCubbin. One travel adventure can inspire many. After a moving humanitarian trip to Sudan, TV writer and producer Josh Bycel created One Kid One World, an organization that rebuilds schools, sponsors education, supports after-school activities, and improves communities in Kenya and El Salvador. 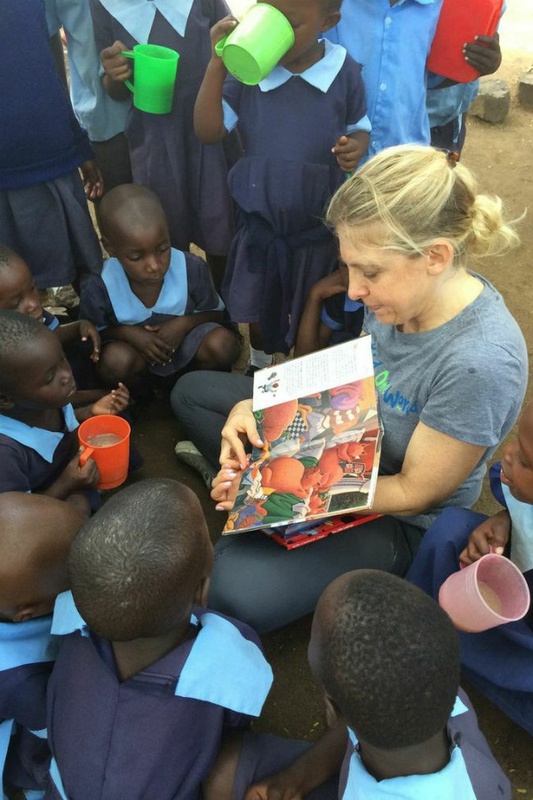 We chat with co-executive director Tracy McCubbin about their volunteer trips, who they're for, and how they benefit both sides of the equation. 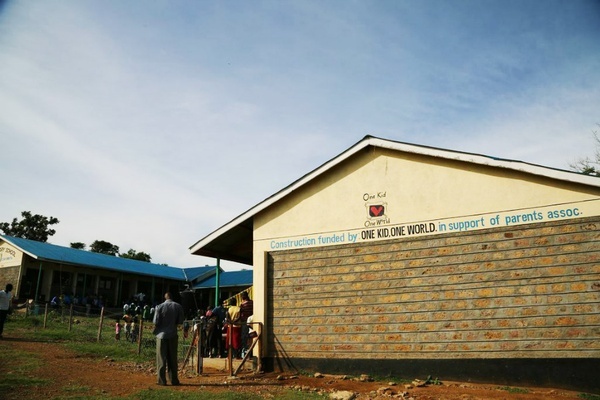 The One Kid One World volunteer program offers trips to Kenya and El Salvador that focus on improving schools that already exist to provide a better education for children in poor villages. We operate on a simple principle: As outsiders in these countries, it's not up to us to determine where a school is needed. Simply put, we never build schools from the ground up. Instead, we engage good traveling samaritans in physical improvement projects that are targeted to their specific strengths. Volunteers are expected to get their hands dirty, and anything from planting a garden to cleaning a classroom is fair game. There's also a huge emphasis on interacting with kids and teachers at school. These aren't the trips where you stand around and get lectured by a health clinic. They're the kind where you physically help create a good and engage those benefiting from it. Painting classrooms in El Salvador. Giggling children are quite the reward. We perform an "extreme school makeover" over a long weekend. It's great for professionals who want to participate in a humanitarian trip but don't have the time to take off from work. We usually take a Thursday night red-eye that lands in El Salvador the next morning. After dropping our things at the communal beach house, we get right to work. Most of the hard repair work on the schools is done by local construction companies that we commission. Volunteers then step in and clean, organize, and decorate the classrooms, often with beautiful mosaics that we make together. In the afternoon, volunteers get to know the children. Both parties ask each other questions, fostering an atmosphere of cultural immersion and understanding between the volunteers and the kids, many of whom have never met people from the United States before. As you can imagine, they are full of questions. Saturday is extreme school makeover day. We hire a DJ, throw a pizza party, and turn redecorating the school into a fiesta. We spend the afternoon doing self-empowerment exercises with the kids — mostly with the girls — that teach them to identify and vocalize their strengths. It's a huge confidence boost for these kids to point out their strengths and have them reaffirmed by the volunteers. We wrap up the party by learning traditional moves from a local dance teacher. Sunday is tour day. We zip-line through coffee plantations, explore the city of San Salvador, and shop our way through stalls of old artisans attempting to redefine their brands. We stop by a local school to do a quick empowerment project with the girls there, and end our day with dinner at a gorgeous restaurant. We all reminisce about the past weekend, say our goodbyes, and are off to the airport. By Monday morning, one hundred kids that had never been to school before will have signed up for classes because of their experience with the volunteers. Who said school can't be fun? The trip is ten days. We work in different schools throughout the region for one or two days at a time. It's intense. We're up early working hard every single day. We land in Nairobi for our first project. 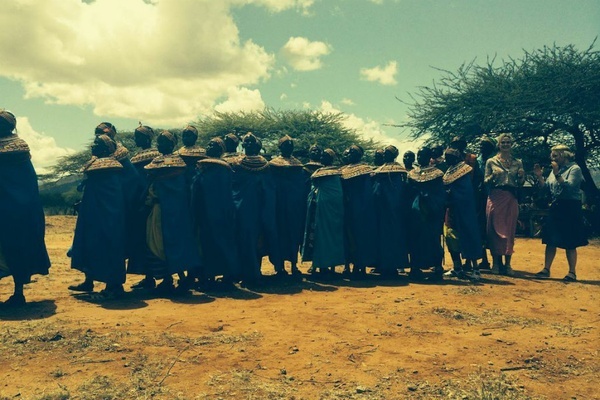 Next we're off to Samburu for safari and a visit to a few of our schools there. Aside from decorating, we do empowerment projects with children. My favorite exercise, one we do with the girls, is called "I am, I will be." They write a personal positive quality on a piece of paper ("I am good at math"). On the other side, they write what they will achieve because of it ("I will be an accountant"). For the next five days we make home base at a research institute and travel by Land Rover to projects on Rusinga Island. We stop for a day or two at each school, and fit in some tourism in between — a nice lunch or quick safari. We charter a little plane and fly over Rift Valley and Mount Kenya, passing clear views of the unbelievable landscape below. We end each day by watching the sunset over Lake Victoria, sharing a Tusker beer, and chatting about the day at little hotel restaurant called Safari Village. How often do you go on these trips? Trips to El Salvador run two to three times a year, and to Kenya once a year or every other year. Josh or I chaperone every trip. However, we have really close relationships with our partner organizations on the ground, so if someone has a specific time they want to go and we don't have a big trip coming up, we can connect them with the local nonprofit and organize something for them. For example, this past October we took fourteen ladies to El Salvador for an all-girls trip. We're a very fluid organization and we like to work around our volunteers' schedules. The product of labor in Kenya. Can you tell me about One Kid One World's school partnerships? We work closely with an all-girls school in Pasadena that fundraises for our local nonprofits. 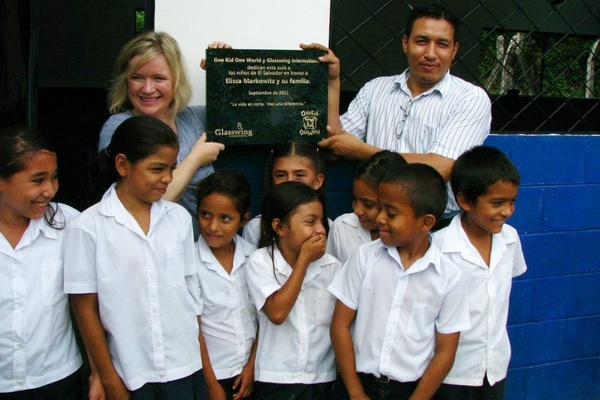 A group of their students and teachers have gone to El Salvador three times to do an exchange school make-over. It's an incredible experience for them. They get to see where their donations go, meet people that benefit from them, and learn firsthand how much they're helping other children and communities. How does tourism factor into the equation? Tourism is huge. We feel strongly about community involvement and want our volunteers to experience the country through the eyes of locals and see parts of the country they may not see otherwise. In El Salvador we release baby turtles into the sea and zip-line through a coffee field. In Kenya we go on safari. We want people to fall in love with the country, just like we have. Who are the trips best for? Travel junkies. Donors who want to see where their money is going. Travelers who are comfortable being uncomfortable. And people who want to break out of their routine. The trips are down and dirty humanitarian travel, and many of the places we stay are rough around the edges. Yet, people come on our trips having never traveled this way and it completely changes their lives. The trips create a symbiotic relationship in the communities. The kids benefit, the schools benefit, and the community benefits (often times communities use the schools we build as community halls). I honestly can't say who benefits more — the volunteers or the locals. Can you tell us about a favorite moment from one of the trips? The first year we went to Kenya, when we were getting a new school up and running, we went door to door to the students' homes to tell them that if they came to school we would pay their fee. We visited a fifteen-year-old girl named Phiona, who's child had just died of malnutrition. She was living with her uncle and had lost twenty-two members of her family to HIV. When we returned to Kenya three years later, she was graduating first in her class. These are the opportunities we hope to provide through our organization. To see them come to fruition is incredible. 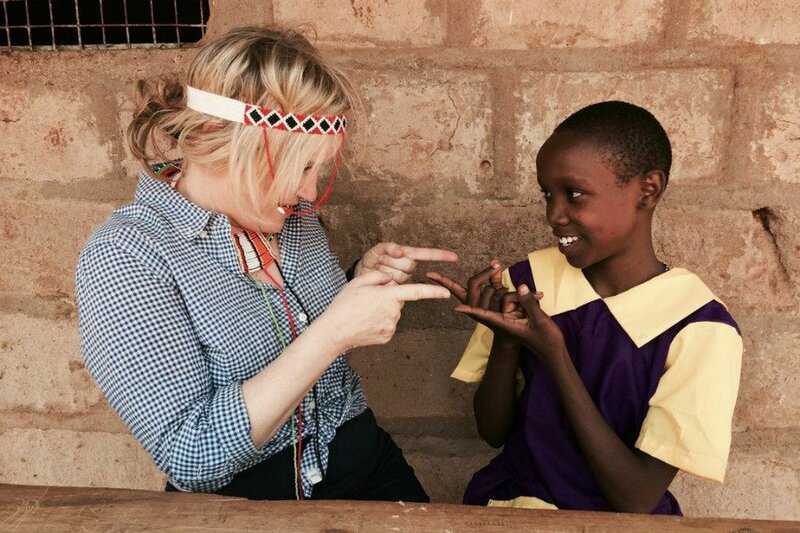 Stephanie March was teaching a class about New York in Kenya. The girls all had a blank look on their faces during the lesson, and asked her with concern afterwards, "where do you keep your cows?" I asked Stephanie, "Did you tell them that there's no grass in New York?" She said "No, I forgot." What's in the works for One Kid One World? We hope to expand our reach by increasing the number of trips per year and working more in Central America, potentially in Nicaragua or Panama. We're not looking to expand in Africa, as we feel really strongly about the areas in Kenya we're involved in. There's lots of work to be done there. We want to be able to provide quality service rather than quantity. Has working with One Kid One World changed the way you think about travel and charitable giving? In Kenya you can send a girl to school for 300 dollars. In California, you can buy a pair of jeans for that amount of money. Running these programs has allowed me to stop and ask myself: "Do I want to buy a pair of jeans or send a kid to school?" You can change a child's life with one good deed. These kids come from poor, broken homes and often feel isolated and invisible. To have a group of people show up for them creates an amazing sense of self-worth, and that can change the course of their lives. Tracy is the co-executive director of One Kid One World and the owner of dClutterfly, a business that helps people declutter their homes and offices. She travels for the chance to make a difference, and the chance to experience something different.